« The leitmotiv of the exhibition are basically two » – Pier Paolo Patti explains. First of all « the relationship with the media : since most of the material is purposely “borrowed” from the web – which means that it is broadly available, and the willing to keep or not such information is at users’ choice (when not satisfied by the generalist media) ». Second, the whole project is « strongly focused on the geopolitical repositioning of the Middle East, that is - from Christ until today - a continually developing and constantly conflicting geographical area, where the political assets is stuck in a never-ending-change due to the resources, the boundaries, the religions. The issues afflicting that specific part of the world have been basically the same for thounsands of years ». Abbà, forgiveness and unawareness, the solo exihibit of Pier Paolo Patti curated by Raffaella Barbato, has been shown at the neapolitan gallery PrimoPiano. Articulated in three rooms – namely Immanence, Incarnation, Transcendence, respectively connoted by the black, the red and the white colours – the exihibition immediately appears as a hard challenge not only for the audience, but for the art critic itself : due to the plurality of the media used by the artist and, consenquently, the huge variety of languages displayed, the density of contents and references, Abbà evokes several and opposing states of mind. In recent years the artistic language of Patti seems to know a considerable growth. On one hand the topic of the mass media – which is one of the two fil rouge of the exihibition – has been approached by the artist in a new way, introducing new means of expression to convey the messages, far away from the “videomaker label” that has been sticked to the artist for very long time. On the other, the calling for the social issue and the cry of protest – a “trademark” of the artist – leads Patti to talk about the martyrized theather of the contemporary Middle East, backwards to the very beginning of our era, through the meticolous study of the Gospels, both canonical and apocryphal. The whole path through the three rooms is marked by a sort of materialization of the Adornian negative dialectic rather than the Hegelian triadic dialectic, as there is no idealistic overcoming, but a materialistic impossibility to deny the primary negation on a higher level. After all, Christianity – and perhaps even more Catholicism – has an undeniable materialistic component that is the indispensable counterpart of its Kierkegaardian way of being a paradox, a shortcircuit. And such shortcircuit – as semantic as of contents – is exactly what Pier Paolo Patti can handle the most ! The shortcircuiting pair life-death in Abbà goes beyond the food. Here, a tragic détournement of the traditional iconography of the Nativity – three frames taken from a YouTube video and put back together in order to re-create the famous scene Father-Mother-Son – shows the opposite meaning of this icon because the Son, in Patti, has no life. The celebration of life of the Nativity suddenly turns into a Lamentation over the Dead Son. 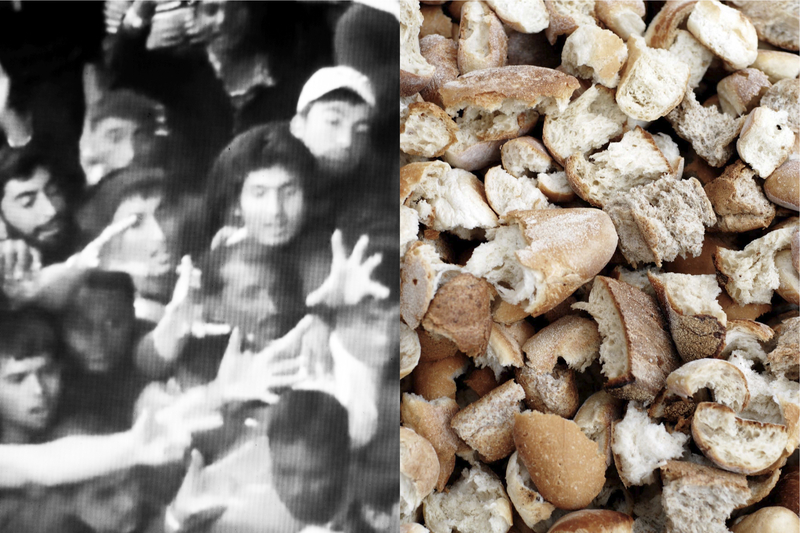 Death, Gospel and food interact paradoxally and caustically towards the end of the artistic path, where near a sequence of frames (taken from the web) depicting Syrian refugees on the border of Hungary while receiveng parcels of food - « humanitarian meals », comments the artist - there is a mountain of stale bread and a shrine containing imprints of fishes that suggest the idea of a common grave or, worst, the cargo of a boat carrying dead poeple : again, a reference to the lethal tragedies of our time, included the waste of food, and to his counterpart, the myracle of Christ. « On the one hand, » says Patti, « with the expansion policies we are stealing resources from the Arab countries, that are countries in conflict ; on the other hand, we are returning crumbs all along our borders ». Again, the glory of the Gospel story is reversed in the misery of the pseudo- globalized contemporary world !This and so much more you will find in the recent solo exihibition of Pier Paolo Patti, which higlights the resources and also the circularity of his cultural, artisical, political and social background – as Lenin said, « everething is connected ». In his blood flow the gloomy paintings of the seventeenth century in Campania, the strong chiaroschuro contrasts marked by the passage of Caravaggio in Naples, the mismathced juxtaposition of the “political conceptuals” like Martha Rosler or Hans Haacke. There is the heritage of a Judeo-Christian tradition with Catholic imprint (this one seized passively at first time, then happily reevaluated through study and passion, even though not with Faith), as well as the tradition of the labour movement, which starts from the writings of Engels and Marx and lands – through several contamination – to the radical and political music of italian bands like 99 Posse and Assalti Frontali. « A glance to the immediate and one to the infinite », these words from the song Banditi (1997) of the band Assalti Frontali explain the complex of the exhibition Abbà and summarize the best the identity of both the artist and the man Pier Paolo Patti. Patti is and always will be a “comrade”. Despite the other “comrades”, he doesn’t believe anymore in “religion opium for the people” : Patti does not follow the Christianity, nor other credo, anyway he is fascinated by and maybe – even if it would be hard to admit it - he is now in need for this transcendend dimension.